“It is sixty years since the death of Australian pianist Noel Mewton-Wood and as the years pass it seems that his talent may be forgotten by future generations. This could be because he made few commercial recordings. Radio performances were mainly broadcast live in the first half of the twentieth century and only a small portion were recorded for broadcast at a later date. Mewton-Wood died at the age of thirty-one and, therefore, had a very short career, so any broadcasts that add to his recorded legacy are of the utmost importance. 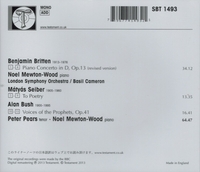 Benjamin Britten gave the premiere of his Piano Concerto at the 1938 Proms, but he revised the work in 1945, specifically the third movement. This version was first performed by Mewton-Wood at the Cheltenham Festival on 2 July, 1946 with the composer conducting the London Philharmonic Orchestra. The London premiere was given at the Proms on 2 August 1946. On this occasion the pianist was joined by the London Symphony Orchestra and Basil Cameron. The following December the same forces went into Wembley Town Hall to record it for the BBC Transcription Service. 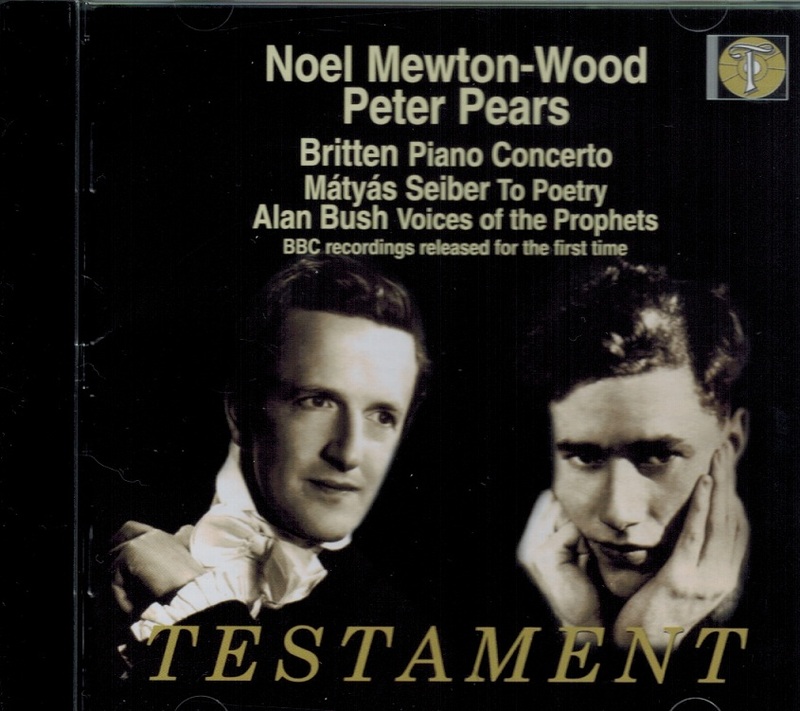 Pears commissioned two new works from British composers for a recital that he and Mewton-Wood were to give in May 1953 – ‘To Poetry’, by Mلtyلs Seiber and ‘Voices of the Prophets’ Op.41 by Alan Bush. Four months later, the BBC asked the two musicians to record the works for future broadcast. Pears and Mewton-Wood went to the BBC studios in Maida Vale at 2.30pm on the 25 September 1953 to rehearse, then recorded the programme at 4pm. Noel Mewton-Wood’s journey from underestimated virtuoso to present-day icon is cause for both celebration and irony. Glowing testimonials to his ‘genius’ (Sir Malcolm Sargent) from Myra Hess, Beecham, Schnabel, Bliss, Hindemith and Britten were countered by indifference from the major record labels and concert managements, a situation that doubtless contributed to his suicide at the age of 31. Behind an ebullient surface, Mewton-Wood was a romantic idealist, susceptible to depression and mood-swings. So it is hardly surprising to find the dichotomy reflected in performances which alternate a luminous poetic delicacy with a rare energy and bravura." “Noel Mewton-Wood (20 November 1922 – 5 December 1953) was an Australian-born concert pianist who achieved some fame during his short life. Born in Melbourne, he studied with Waldemar Seidel at the Melbourne Conservatorium until the age of fourteen. After further studies at London's Royal Academy of Music, Mewton-Wood spent time with Artur Schnabel in Italy. In March 1940, he returned to London for his début performance at Queen's Hall, performing Beethoven's third piano concerto with the London Philharmonic Orchestra under Sir Thomas Beecham. He later performed in France, Germany, South Africa, Poland, Turkey and Australia. Mewton-Wood's The Times obituary of 7 December 1953 described his debut performance: ‘At once his remarkable control and his musicianship were apparent: the ascending scales in octaves, with which the pianist first enters, thundered out with whirlwind power, but he could summon beautiful cantabile tone for the slow movement and the phrasing of the rondo theme was admirably neat for all the rapidity of the tempo; a true understanding of the relationship in concerto between soloist and orchestra, and of the soloist's part in ensemble, betokened the musician, the potential chamber performer’. 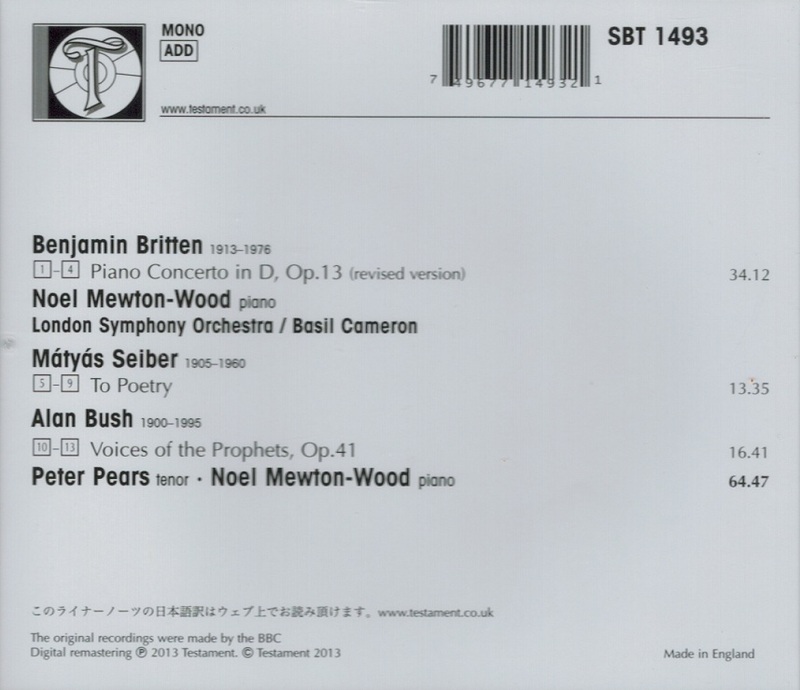 Mewton-Wood was a close friend of Benjamin Britten. In 1952-53, while Britten was occupied in the writing of his opera GLORIANA, Mewton-Wood deputized as the accompanist for Britten's partner Peter Pears. At the age of thirty-one, Mewton-Wood committed suicide by drinking prussic acid (hydrogen cyanide), apparently blaming himself for the death of his partner. Benjamin Britten wrote Canticle III: ‘Still falls the rain’ for Mewton-Wood's memorial concert.